An elegant and dramatic 'Y'-shaped Necklace with a delicate chain and Cubic Zirconia drop Pendant. Three sparkling stones - one pear shaped and two round - are set into a short hanging chain and finished with a smooth rub over setting. 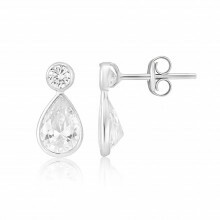 A gorgeous piece that will transform any outfit into a special occasion look.